Last Sunday I shared my Pumpkin Scone with Pumpkin Spice Icing recipe on the blog and the moment I bit into it I knew I could change-up the recipe and make Pumpkin Spice Biscotti. I love when recipes can double-up, which means you can create two different recipes at the same time. This is always handy when you have a bake sale to bake for or you are having a party or lots of guests over to the house. My wife adores biscotti because of the crunchy texture especially with a hot cup of strong coffee or mug of tea. The last batch of biscotti I made was Nicola’s lemon biscotti because my wife wanted me to try her recipe. She was more than thrilled that I was finally making pumpkin biscotti and when they were done she gave me the thumbs up which made me proud. I never know how a recipe will turn out but this one I was quite confident that it would be a success. I’ve made biscotti recipes many times but I’ve never created one from a scone recipe before. If you’ve already make my pumpkin scones you will notice that this pumpkin biscotti recipe is exactly the same as the pumpkin scone recipe except I don’t cut the dough into triangle wedges. Instead I make two large logs that are shaped like a biscotti and bake them in the oven. I just wing it when it comes to shaping the logs but I try to keep the length longer. The baking time was a bit longer but not much. Anytime I follow a recipe I am always cautious of bake time because everyone has a different oven. Once the pumpkin biscotti were done I let them cool completely before cutting them. I am very rustic when it comes to scones and cookies so I just took the knife and made slices. I did try to keep them the same thickness for the second bake. Once the pumpkin biscotti were cooled and cut I pre-heated the oven to 200 degrees and let them bake for an additional 2 hours. The slow and low second bake for the pumpkin biscotti will allow them to harden up. Test a biscotti before you pull them out to see if you get your desired ‘crunch factor’ otherwise leave them in for longer. They do have a bit of a different texture than a typical biscotti but they still turned out perfect. Keep in mind this was a pumpkin scone recipe. The great thing is you can save time! Once the pumpkin biscotti cooled again I made the same batch of pumpkin spice icing as I did for the scones and I drizzled it on top. I’m afraid I’m not a pastry chef so the drizzle is thicker in some areas. If you are neater than I am you can make them even prettier. I was happy with the way the pumpkin spice biscotti turned out and will definitely be making them again. If you love biscotti you must try these amazing pumpkin biscotti that I created from my pumpkin spice scone recipe. Easy to make and less fuss in the kitchen for two recipes. In a large bowl add the flour, brown sugar, baking powder, baking soda, salt and all the spices then mix.Add in the cold butter and cut it with a pastry blender or with two knives until it looks like coarse crumbs. In a second bowl add your wet ingredients- eggs, pumpkin and ½ cup of buttermilk and mix. Turn the mixture onto a floured surface and knead it about 8-10 times. Bake in the middle rack of your oven. Once completely cooled cut the biscotti length-wise about the same thickness and bake them again in a 200 degree oven for 2 hours to harden. This is dry baking. Once cooled you can drizzle the pumpkin spice icing on them and enjoy. This was a fun recipe to work with and I hope you give these pumpkin spice biscotti a try and leave me a review below to let me know what you think of them. If you made any changes please let me know too because I’m always interested in what people do to make a recipe their own. If you are looking for a great place to order your spices check out SpicesForLess.com . Check out my full Recipe Index Here. My mom loves to make pumpkin biscotti! 🙂 Btw, it looks very delicious, I can imagine the smell of it. I think I have just found a good recipe that my kids would surely love especially this coming Halloween. 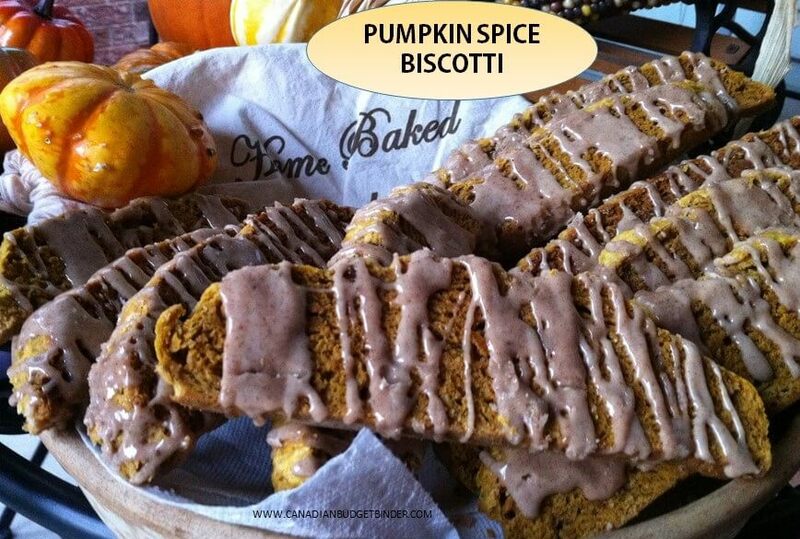 I am really a fan of this pumpkin biscotti. Thanks Mr CBB. This looks so yummy!!!! I will have to have a look at my pumpkin in the freezer at the amounts to see what I can use for these and the scones!!! !